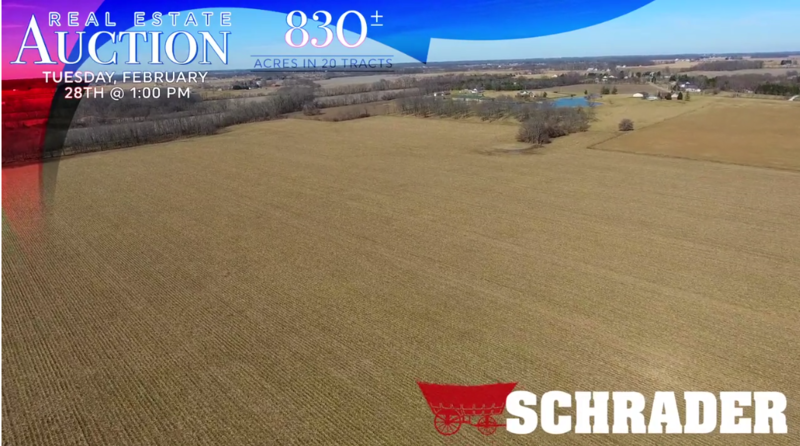 MORRISTOWN, Indiana — Productive farmland, fenced pasture, woodlands, and commercial buildings will be among the properties offered at auction February 28 in Indiana’s Hancock and Shelby Counties. Schrader Real Estate and Auction Company will conduct the auction. “This will be an opportunity of interest not only for farmers, but also for investors, developers and industrial buyers. These five farms and six commercial properties — 830 acres in all — had been acquired over the years by the family that owned CGS Services (formerly Caldwell Gravel Sales) but were not integral to the business itself and were not sold with it. The farms are in the Morristown area, less than an hour southeast of Indianapolis,” said R.D. Schrader, president of the auction company. “Several of the tracts have nice pasture with fencing and cattle pens, and some of the tracts also have considerable frontage on Big Blue River. Some tracts also have industrial zoning, as well as municipal water and sewer,” said broker Steve Slonaker. The auction will begin at 1 p.m. Tuesday, Feb. 28, at Indiana Grand Racing-Casino, 4200 N. Michigan Road, Shelbyville, Indiana. An auction on Wednesday, March 1, will feature equipment used on the farms, including tractors, wheel loaders, a backhoe, loaders, spreaders, livestock equipment and other machinery. That auction will begin at 10 a.m. Wednesday, March 1, at 11823 North CR 250 E., Morristown. Inspection dates for the real estate will be 2 to 4 p.m. February 10, 16 and 23 at the Bluebird Restaurant, 158 East Main St. Highway 52, Morristown. Details are available at schraderauction.com or by calling 800-451-2709. Inspections for the equipment will be 10 a.m. to 2 p.m. February 24 and 10 a.m. to 4 p.m. February 28.